Rafting.com is currently seeking qualified outfitters for Featured Listings. If you are a local rafting outfitter in Colorado and would like to see your company listed here, please contact us for more information. No matter what your experience level, Bighorn Sheep Canyon on the Arkansas River will provide everyone with a solid dose of whitewater fun and excitement. Ancient granite outcroppings provide a brilliant backdrop to the Colorado mountain scenery. Be sure to keep your eyes out for Bighorn Sheep that are frequently spotted on this trip. With numerous Class II-III rapids, the Bighorn Sheep Canyon run is perfect for families and beginners. The Royal Gorge section boasts some of the most exciting and heart-pounding whitewater in the west. This run takes you under the famous Royal Gorge Bridge, suspended over 1000 feet above the river. Ideal for experienced boaters who love big hits at high water and tight technical maneuvers at lower flows, the Royal Gorge is sure to please the more advanced paddlers. 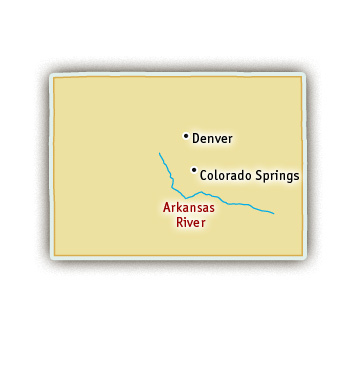 Arkansas River rafting trips are available daily from Memorial Day through Labor Day.